I posted recently about the anxiety and stress I was feeling about this race and about running marathons in general. And when I posted that, I felt like I was driving myself batty over it. 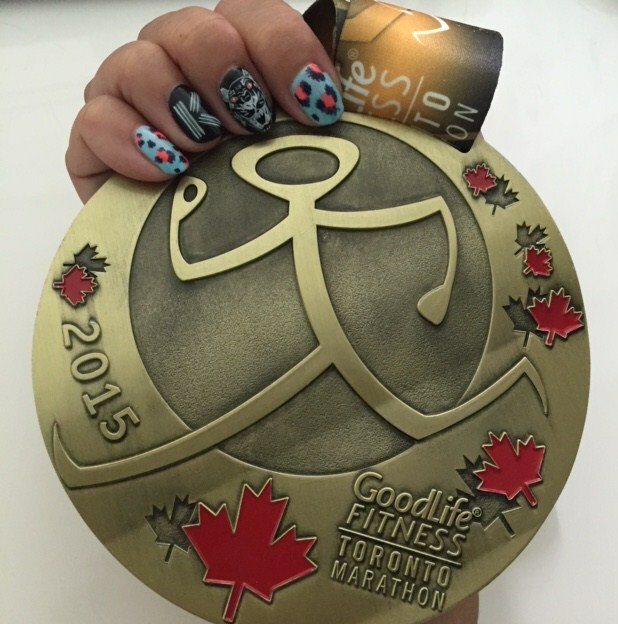 So in the last four or five days before the Goodlife Toronto Marathon, I just tried to push the race out of my mind. It helped that my schedule was busy. I didn’t check the weather forecast several times a day. I pushed out of my mind the pace I’d have to maintain for 42.2k in order to qualify for Boston. And I was mostly successful, but the panic bubbled up as the weather warmed up (running in cool weather is, of course, easier) and again when I printed out my pace band, and then again when I went to pick up my race kit. I wasn’t feeling confident about qualifying but reminded myself all I could do is do the best I could on Sunday. Can I say I did my best? I’m not sure. I knew I was in trouble early on in the race. I remember at 8k I was already feeling tired and I was finding it terribly hot and that made me feel anxious, and the hill at Hog’s Hollow was rougher than I’d ever remembered it to be! Thankfully, although I found the first 10k or so quite warm, it felt cooler for the rest of the race and conditions were quite ideal. In shorts and my tank top, I wasn’t overheating and there was a wind, which helped to keep me from feeling uncomfortably sweaty. I knew if I was already tired at only the 8k mark, that didn’t bode well for the next 34 kilometres. I told myself it was just because I hadn’t warmed up and gotten into a rhythm yet. And then I started slowing down. I started out with a pace of 5:05 and eventually it crept to about 5:19, which I kept consistent until the halfway mark (I think, I can’t find my splits online). “If you can maintain this pace until the end of the race, you can meet your mark,” I told myself, but even as I did, I knew that this was likely not going to happen. From past races, I know I typically tend to slow down a lot sometime after 32k. So if I had already slowed to my goal pace before the half-marathon mark, maintaining it would be very tough. My legs felt exhausted very early on; I wasn’t in pain but I could feel lactic acid building up in my legs. Twice, when I blinked slowly and my eyes were closed a fraction of a second longer, I actually got scared I was going to pass out, so I reminded myself to keep hydrating and to not rest my eyes (as a side note: I am prone to fainting, but have never experienced it when running). I think my biggest downfall, though, was the mental struggle. As qualifying for Boston quickly slipped away from me around the middle of the race, I had many times when I just thought “I’d like to just stop and sit by the side of the road and not run anymore.” As I was scared of dehydration and wasn’t pushing myself to make my original goal time any longer, I stopped at every water station (in Chicago in the fall, I didn’t stop even for a second, I ran while sipping water from my bottle). At first my water breaks were for just two seconds but then (since I’d long since said bye bye to meeting my goal) I took my time drinking water or Gatorade, taking at least 30 seconds or more. During one brief walk break, I actually toyed with the idea of walking to the finish line, but I was still many, many kilometres from finishing. I managed to snap myself out of it each time I felt like stopping altogether, but I’d lost my drive. When there was 5k left, I managed to convince myself to run straight through to the end and settled into as comfortable a pace as I could, and only pushed in in the final few hundred metres. Disappointed with myself, I only checked my official time today (Tuesday); I’m normally rushing to check my time immediately after crossing the finish line, but dejected and knowing it was something over four hours and nowhere near the time I’d been hoping for, I haven’t had the heart to until writing this post. With a 4:03:54 finish, that’s my third slowest marathon out of the eight I’ve run. It is 26th out of 93 women in my category, which even I am pretty happy about. This race did confirm what I’ve thought, though: I believe I’m solidly a 4-hour or so marathoner (give or take given all the factors that impact a race such as the weather and the route, etc), and that Chicago Marathon last fall was an exception where somehow, some way, I managed to crank out the race in 3:46. 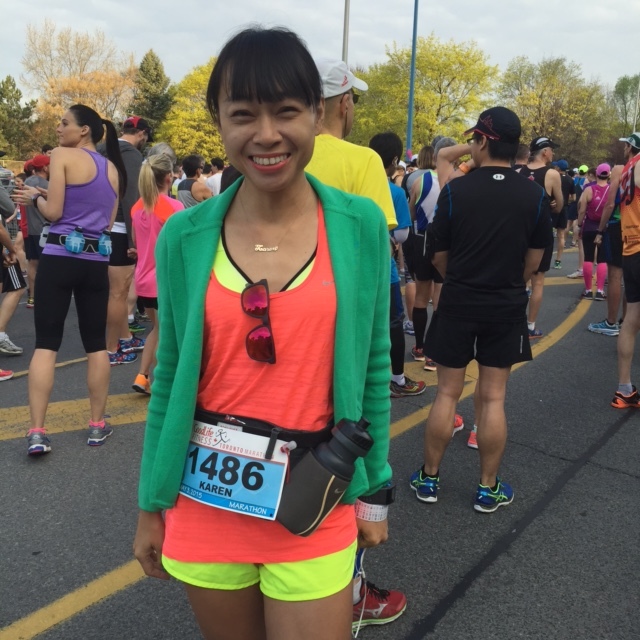 Next up: I have the Sporting Life 10k in Toronto this Sunday (why did I again think this was a good idea?? ), the Run for Women in Oakville on May 31, and the Nike Women’s Toronto 15k in Toronto (get your gait analysed at the Nike Toronto Eaton Centre if you haven’t already). As for my racing in the fall… Another marathon? Take a break? Run a half? I’ve got lots to mull over.